Bronze fully working AeroPress was awarded to the 1st prize winner of the 2nd World AeroPress Championships held in Oslo during June 2009. Wow, when will these be available to the rest of us. We particularly enjoyed Ben’s method of inverting the AeroPress and using a longer brewing time with a smaller dose of coffee. 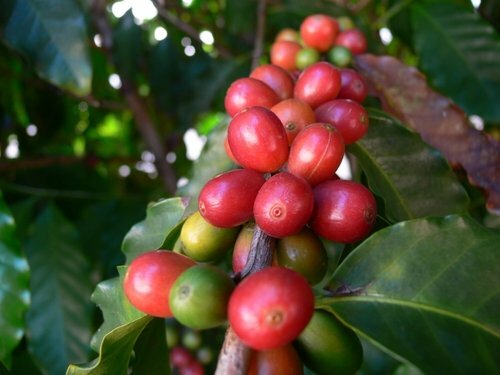 This method produces a beautiful cup of coffee and we found it particularly suited for cups of coffee floral and fruity characteristics. We recommend a good Ethiopian or Kenyan. The aromatics you’ll get from one of these cups is insane. Begin by boiling freshly filtered tap water. Apply a paper filter and run it under the tap until its rinsed. Fill your inverted AeroPress with boiling water, apply the filter, flip and press the boiling water through the filter to ensure there is absolutely no paper taste and to heat up the system. Once again, invert your AeroPress. The plunger should be about 1cm from the bottom. Grind off your coffee, slightly finer than filter grind (Should be 14g by weight) and put it into your cup or glass. Keep this handy. Bring your water to a rolling boil. Put your inverted AeroPress on a scale and zero out. When the kettle hits a rolling boil, shut it off, open the lid and start your timer. Wait thirty seconds to allow the water to cool a bit. Add 1dL or ~95g by weight of your water to the AeroPress and quickly zero out the scale again. Add start your clock and add the 14g of coffee to the water and give the coffee a quick but efficient stir to completely saturate the coffee grounds in the water. Add the remaining 1dL or ~95g by weight of water to the coffee slurry. The scale total should now read 109g. Begin slowly plunging. This should take about 25 seconds. Plunge until you hear any hissing or air escaping through the coffee puck. 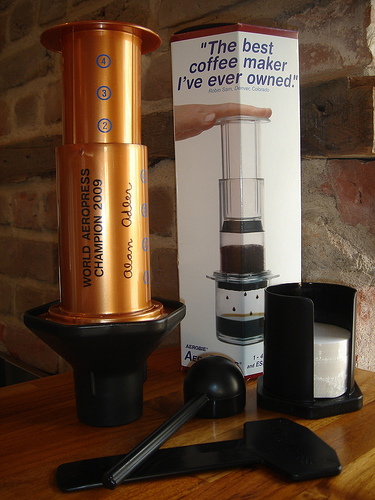 Quickly pull the plunger back up and invert your AeroPress so it doesn’t leak everywhere.